If you come down from Saanenmöser/Col des Mosses de Gessenay (1280m) or Gestelenpass/Meieberg (1853m), then you can start the climb to Jaunpass from Garstatt (858m) on a minor road that later joins the main road up from Reidenbach (840m) in Simmental. Both alternatives are nice, but you have lesser traffic on the minor road and a more unevenly steep road. It is fairly steep on booth roads with stretches above 10%. From the west side you start the climb at Kappelboden (1021m), well the climb really starts after (857m) or before Charmey (720m), but there is not much climbing to talk about before the turn-off for Mittelberg/Grubenbergpass (1634m). From there it is fairly steep up to the pass on both sides for being such a much used road and here it is often around 10%. 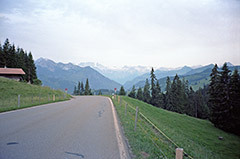 Other comments From the Jaunpass area there are asphalt roads going higher in both directions. To the north to Cuchifang/Bäderberg (1628m) and to the south to Oberenegg (1685m), on which road the actual walking pass is located. Those roads will surely bring better views as it is quite nice in this area! See also: Reidigenpass/Rieneschlipass (1616m), Euschelspass/Neuschelspass (1580m), and Vorder Schwarzesee (Sparenmoos) (1621m).